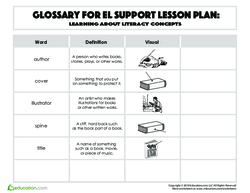 This lesson can be used as a pre-lesson for the Reading WinnersLesson plan. Spine: a stiff, hard back such as the back part of a book. 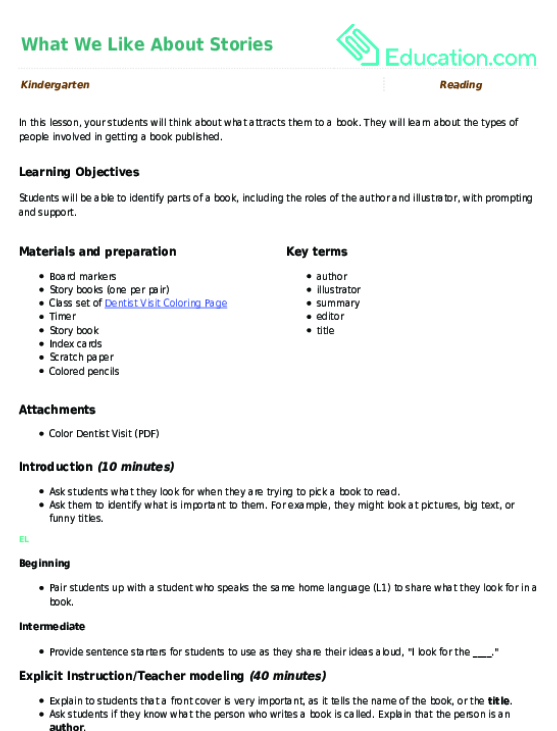 Students will be able to recognise and comprehend the parts and organization of a book. 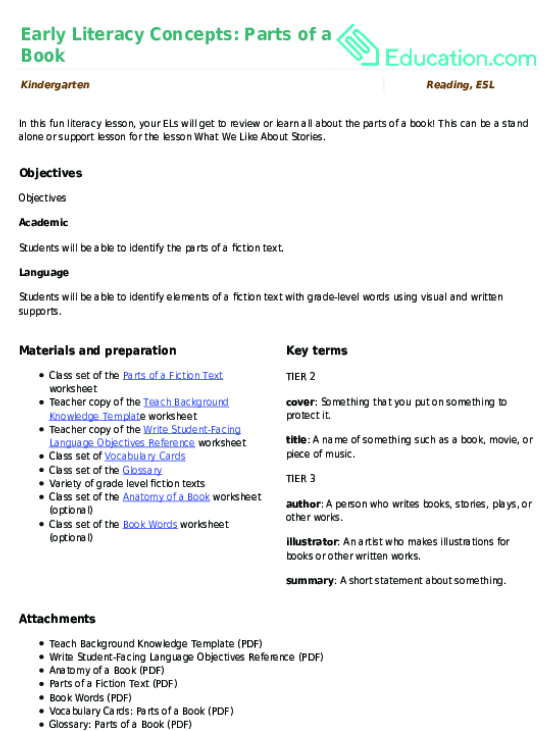 Students will be able to identify parts of a book with grade-level words using visual and written supports. Display a familiar read aloud to the class and ask the class to identify the story. Repeat the title back to the class and say, "How do we know that this book is called ____?" Explain that the name of a book is called a title. We use a title to know what a book is called. Sometimes a title can also give us clues as to what the book is about. Tell the class that today they are going to learn all about the different parts of a book, including the title. Display the big book to the class. 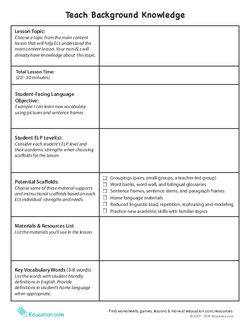 Provide student-friendly definitions for vocabulary words using the Vocabulary Cards and Glossary. 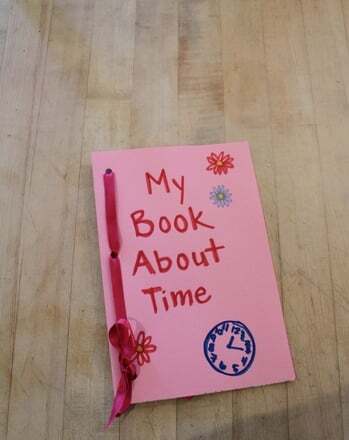 Label each part of the big book with a sticky note as you introduce each new word (e.g., title, front cover, back cover). Pass out one book to each student. Go over each of the parts of a book and have the students identify that part using their own book by pointing to the part of the book. 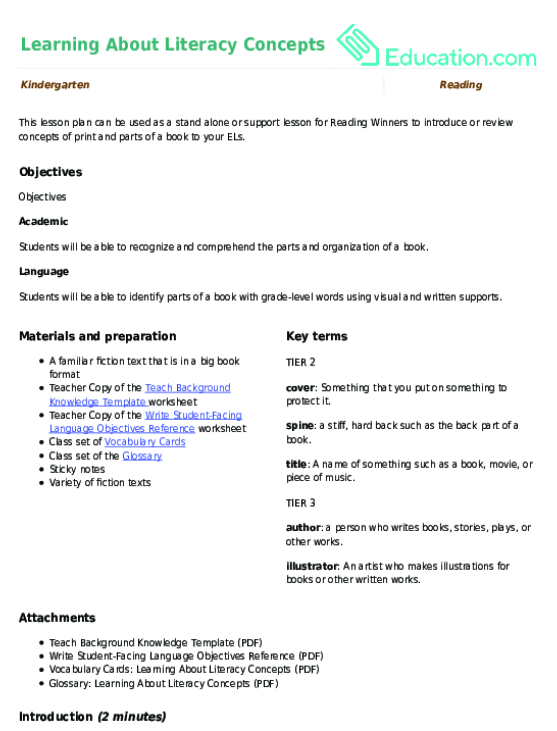 Review the function of the different parts of a book using the Vocabulary Cards as a guide. Provide sentence starters for the students after they point to each part of the book to work on orally completing sentences. The title is the _____. The cover is the ___. The spine is the ____. The author is the ____. The illustrator is the ___. Invite a few students up to the front of the room. Ask them to find parts of the book and explain what the parts of the book are, using the sentence starters for support. Pair students up together and provide each pair with a book. Have students practise identifying the parts of a book. Provide each partnership with a set of Vocabulary Cards and the following sentence frame, written on a notecard: "The ____Is important because ____." Point to the title of the book and model finishing the sentence frame on the notecard by saying, "The title is important because it helps me know what the book is about." Invite a student up to model finding one of the parts of the book and finishing the sentence frame, referring to the notecard for support. Work with a small group of students to identify the parts of a book together. 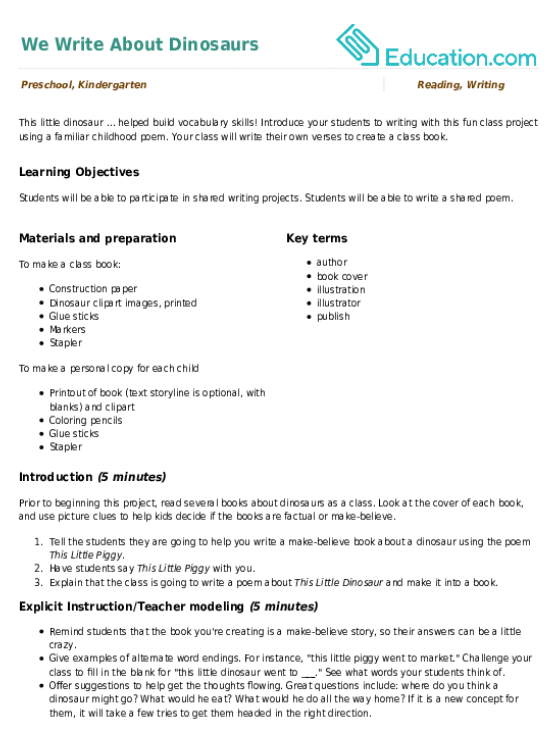 Define the parts of the book in English and student's home language (L1). Have students practise finding the parts of a book using unfamiliar texts. 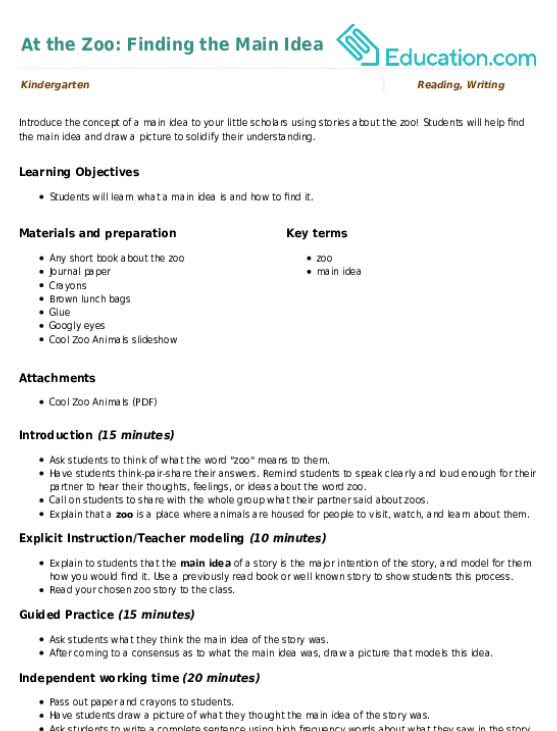 Why are the parts of the book important? How can they help you become a better reader? 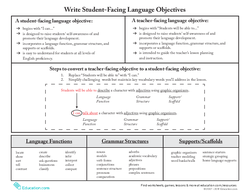 During the group work portion of the lesson, informally assess whether students are able to identify the location and function of each part of the book. Invite students to find a book from the classroom library. 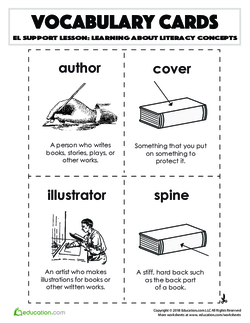 Have students use their Vocabulary Cards to place on the corresponding parts of the book. Rotate around to check if the students are placing their Vocabulary Cards in the correct places. 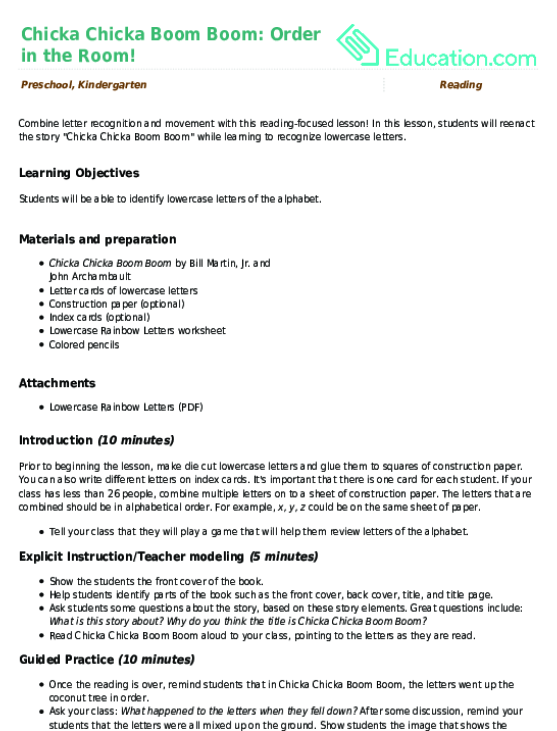 Close the lesson by reviewing the parts of a book and answering any outstanding questions. 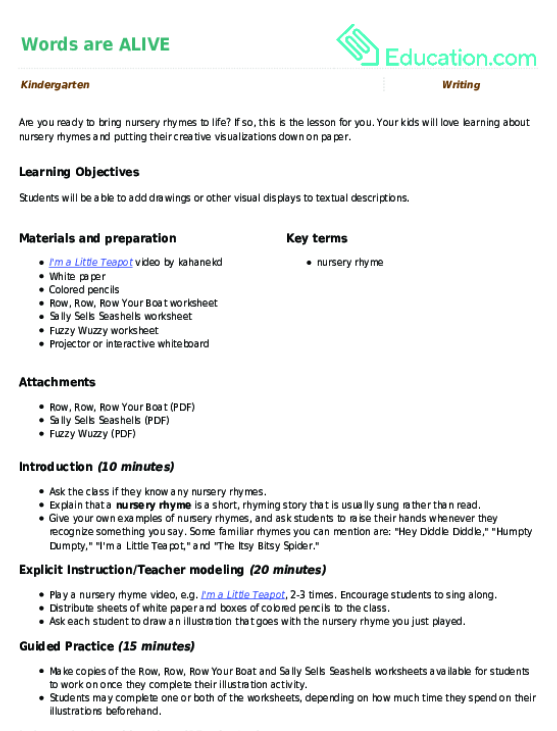 Your kids will love learning about nursery rhymes and putting their creative visualizations down on paper. In this lesson, students will reenact the story "Chicka Chicka Boom Boom" while learning to recognise lowercase letters. Visualizing is a key component of learning to infer from a text. 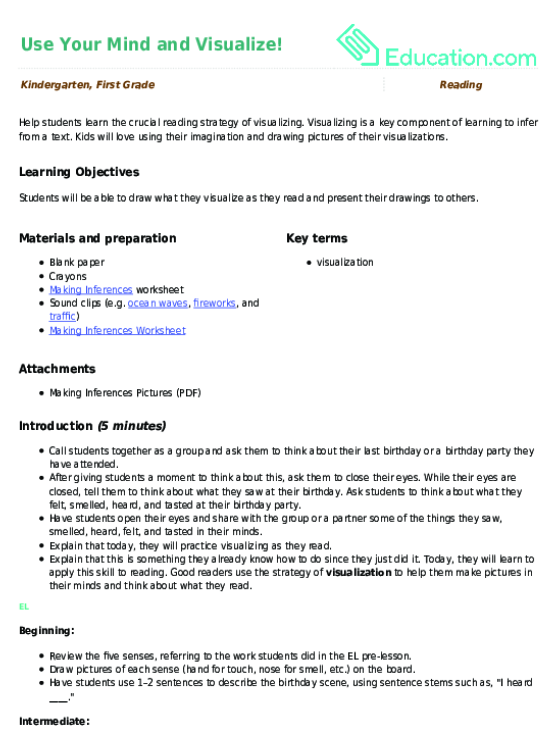 Kids will love using their imaginations to draw pictures of their visualizations. But how about an illustration? 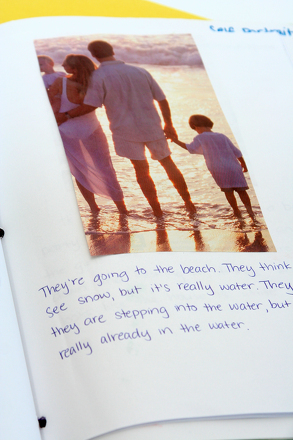 This activity teaches emerging readers to use pictures as context clues.